Did you ever wonder how many calories would you burn climbing stairs towards the top of the tallest buildings in the world? We did! And you’re about to find the answer below. We’re well into February now, and if you’ve made a new year’s resolution, hopefully you’re managing to stick to it! Around 80% of people fail to keep to their resolutions for more than six weeks, so you may find that it’s around now that you’re finding it difficult to stick to yours. If (like many people) one of your resolutions was to get fitter and healthier in 2018, this might inspire you. Shoe retailer Shoe Zone wanted to take a slightly different look at how exercise can help you burn calories. 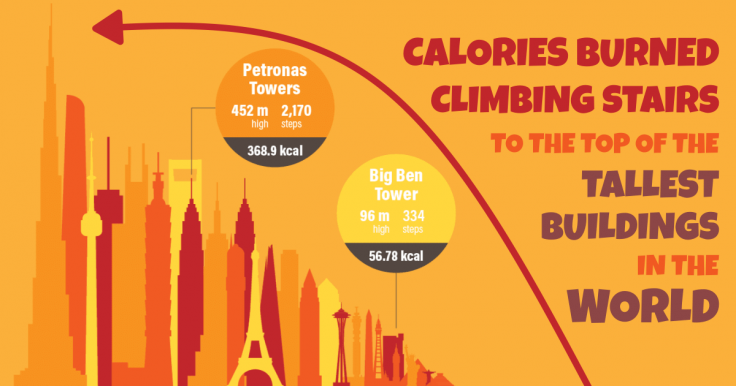 So they decided to find out how many calories you would burn if you climbed each of the world’s tallest buildings and landmarks. Some of the results are slightly surprising. For example, if you climbed the Statue of Liberty all the way to the top, you’d burn off the equivalent of one walnut. To burn off a bagel with cream cheese, you’d need to climb the Burj Khalifa (2,909 steps), the world’s tallest building. That’s more steps than you’d need to burn off a double cheeseburger (try the Taipei 101 Tower, 2,046 steps)! And a Freddo takes only 229 more steps to burn off than a serving of peas! Lowered risk of high blood pressure, diabetes, heart disease and osteoporosis. And of course, it’s an easy and free form of exercise, with no additional equipment needed. Naturally, some of these buildings and landmarks don’t have lifts, so you’ll need to climb them if you want to enjoy the views they offer. As for the others, we’re not suggesting that you actually climb the tallest buildings all the way to the top. But if you ever do find yourself visiting any of these landmarks, why not try climbing stairs for just a few floors as part of your aerobic exercise? You’ll feel better for it and you’ll be able to enjoy the views knowing you’ve earned it! Now, why not treat yourself to a walnut?